All videos/DVD offered by H&V are captioned. 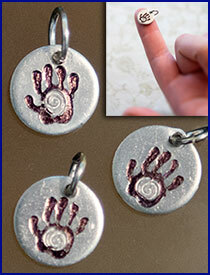 Additional Charges for International Orders-please contact Jeannene at jeannene@handsandvoices.org for pricing. At Hands & Voices our motto is simple: “What works for your child is what makes the choice right.” We recognize that the parenting journey is complex--and what works for one child may not be right for another. Whether you’re a new parent starting out or a seasoned parent looking back, you’ll find the ups and downs, the twists and turns, the challenges and joys in this collection of stories featuring many different perspectives. 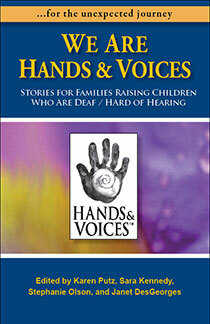 It is our hope that Hands & Voices, Stories for Families Raising Children who are Deaf/Hard of Hearing will provide some guidance on your own journey. Six - 24 copies receive a 10% discount. Order 25 or more and receive a 15% discount. Hi! My name is Annee. I’m a newly single mother of 4 wonderful children. I have 3 boys: 10,5,2 and 1 daughter who is hard of hearing. Hands and Voices has been a great resource to us and after attending the conference in Madison I had the idea for these charms. They are made of 1/2 in 18g pure 1100 food grade aluminum which is hypoallergenic and will not tarnish. Then each one is individually hand stamped, filled in, polished, punched, then ready to go. Fill free to check out my shop and fb for custom designs. 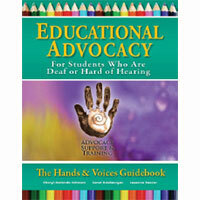 The H&V Guidebook is the essential book for families, advocates, and professionals who support the education of children who are deaf and hard of hearing. Can also serve as a textbook for students in the field. Karen Putz grew up hard of hearing and became deaf as a teen. When her own kids began losing their hearing one by one, she figured she had all the answers. She quickly learned it was a whole other ball game to be a parent of deaf and hard of hearing kids. Karen shares the twists and turns of her journey and the wisdom she's learned along the way. 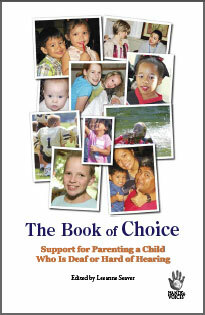 ORDER ONLINE: Click here to visit our secure shopping cart and order your Book of Choice online.